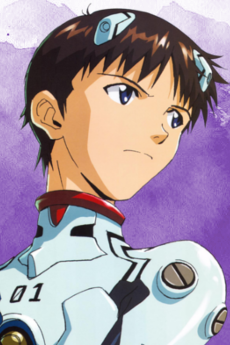 Shinji Ikari is the Third Child ('Third Children' in Japanese), who pilots Unit 01. He is the son of Gendo and the late Yui Ikari. Abandoned by his father, Gendo, when he was a toddler, Shinji often ran away from difficult situations. As a pilot, he panics easily and reacts very poorly to unexpected events. Over time and with encouragement from Misato, he learns to be less cowardly, more outspoken, and more confident, but his progress is all undone when he is forced to kill the only person who ever openly expressed love toward him. His only friends are Toji and Kensuke, but he apparently cares about Rei more than even he realizes.